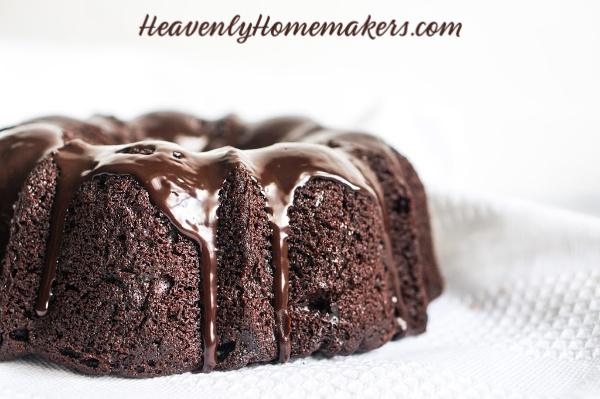 Because I am your friend, I am sharing this Delicious Low Sugar Chocolate Bundt Cake with Chocolate Glaze just in time for Valentine’s Day. See, you can make this cake any time, any day. But Valentine’s Day is sort of an excuse to eat chocolate. So this cake recipe comes to you just in time! Does the recipe look familiar? It should. I originally created and shared this recipe a few years ago, baking it in a regular cake pan. It remains my all-time favorite cake recipe, and I usually spread Low Sugar Cream Cheese Frosting over the top. But sometimes it’s fun to mix things up a little by, you know, pouring your cake batter into a pan of a different shape. Do I know how to party or what? In a large mixing bowl, stir together flour, sucanat, salt, and baking soda. Set aside. In a saucepan, bring oil, water, and cocoa to a boil. Pour liquid mixture into the bowl with the dry ingredient mixture. Add sour cream and eggs, mixing well. Pour batter into a buttered bundt pan. Bake in a 350° oven for 30-35 minutes or until a toothpick inserted in the middle comes out clean. 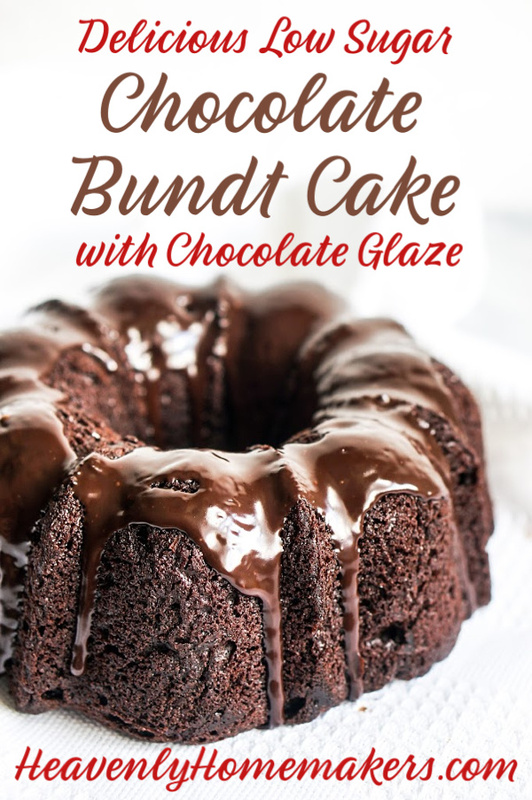 Allow cake to cool completely before drizzling chocolate glaze over the top. In a small saucepan combine butter, cocoa, milk, and honey. Cook and stir over low heat until ingredients are well combined and mixture begins to thicken slightly. Want many more delicious, low sugar treats? Check this out! My sugar-loving family knew right away this cake was different. I think vanilla and cinnamon may help mask the lack of sugar. Texture was good though. Can you use reg self rising flour instead of whole wheat pastry flour?